It’s that time of year! The stress of travel and obligations can leave us exhausted and disconnected, making it difficult to tune in and listen to what our bodies want and need. Layer on diet and body talk, and a general uneasiness around your favorite foods, and you’ve got the perfect storm for overeating and overdrinking. To be clear, you have full permission to eat and drink whatever you want and as much as you want. But if doing this perpetuates a narrative that you should not be trusted around food, and that your body needs to be fixed, perhaps it’s time to try a new approach. 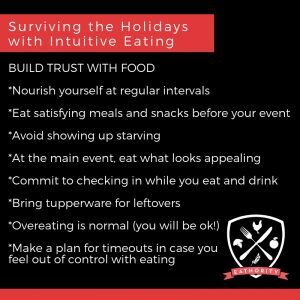 To avoid the pull of diets and Dry January, read below for my comprehensive guide to surviving the holidays with intuitive eating. For an easier read, I’ve broken the tips up into different categories: mind, body, food, and alcohol. Each category addresses an aspect of intuitive eating and provides a map to become more attuned to your needs. Focus on the tips that resonate the most and make you feel good about your eating, drinking and body image leading up to the new year. Taking care of your mind gives you security and confidence that you can handle whatever the holidays throw your way. 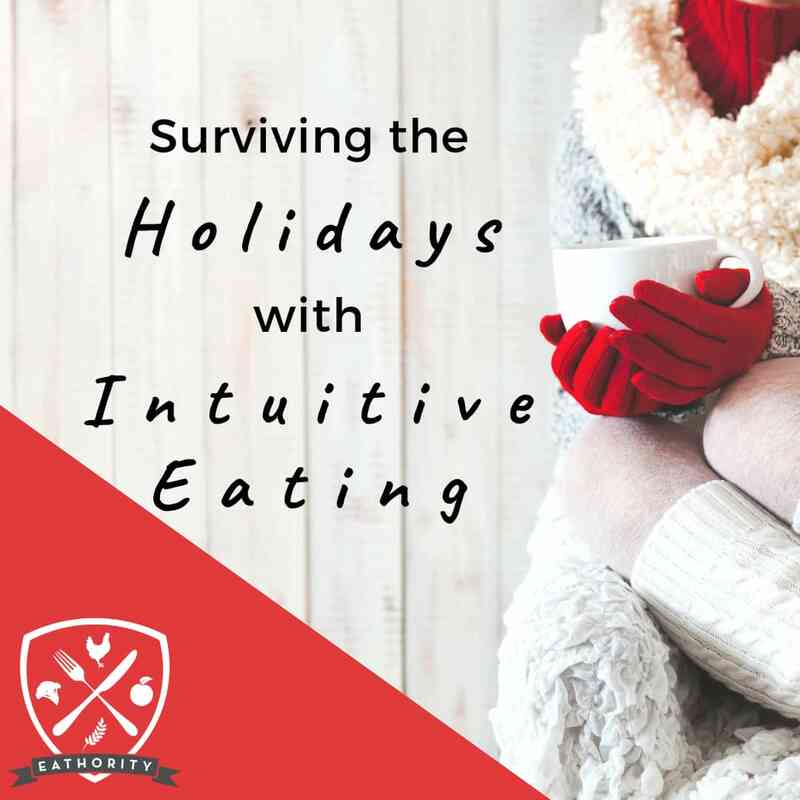 If you are new to intuitive eating, the holidays provide us with an array of learning opportunities. Stay open and curious. Whether it’s fatigue or dealing with a family member’s comments, create a list of situations that might cause you distress. How do you usually react to the stressors you identified? Try not to judge your reactions to situations, instead observe them and ask yourself what purpose these reactions serve. If you feel comfortable, visualize how you could react differently. If a family member comments on your body, could you react with neutrality instead of shame? Visualizing this ahead of time might reduce the sting of the stressor, and may help you react more rationally. People annoyingly think they have the right to comment on your body or food choices. Below are some responses you can use. Now that you know your stressors, have a backup plan that allows you to take a break if you need it. If family time tends to feel like too much, announce that you’re tired and would like a nap. Or maybe you’d like to do some light exercise (walking the dog!). You can also build in an expectation for a timeout by announcing your break ahead of time. Add this to your self-care plan. Save happy posts in an Instagram folder or screenshot them and save them in an album on your phone. Start your day by scanning this folder, and access it as needed. (P.S. I stole this idea from my mentor, Haley Goodrich). This can be helpful for processing any of the day’s events and interactions. The catch? You need to include three positive things that happened that day, too. Taking care of your body can help you become attuned to the signals that guide and influence your eating. If you can’t get enough sleep at night, take an afternoon nap if you have time. Think about energizing ways you can move your body that do not feel compensatory or punishing. This could be a walk outside, a light jog, gentle yoga, stretching or maybe a quick at-home tabata session. If you feel out of sorts, what self-care can you employ that makes your body feel more normal? This is especially important if you overate or overdrank, and your body feels a bit blah the next day. Eating can be joyful and fun, but if you’ve had some negative experiences, it can be a fraught activity. Build trust with food by using the tips below. Eat according to your hunger signals. Avoid skipping meals or “saving calories” even if you have a big event later that day—this might set you up for overeating. And a gentle reminder that one meal will not make you fat or unhealthy. By consistently eating foods that are satisfying, you reduce the need to eat beyond your body’s capacity, especially at special events. Your body will know (or begin to sense) that the next meal will also be good, so it’s easier to stop eating when you’re full. This is a crucial step in cultivating trust around food. Arriving at a party starving will set you up to overeat the appetizers and cut down your enjoyment of the entrees. If you notice you’re hungry an hour or two before an event, have a snack. This advice does not apply in circumstances where the appetizers are the star of the show! Scan the buffet and go for the good stuff. If lots of food looks tasty, sample a bit of everything, then go back for more of the yummiest food. Remind yourself you have full permission to eat anything you want. Check in with yourself on occasion to assess your level of fullness and satisfaction. If you are both full and satisfied but want to keep eating, take a time out and reassess your status 10 minutes later. If you still have the impulse, zoom out. Is there something from which you are distracting yourself, maybe discomfort from a stressor? Overeating may occur because certain foods are not available to you regularly. If you have a hard time stopping your eating because the food tastes good and you only have access to it once a year, remind yourself, “I can have this food whenever I want. I can relive this meal tomorrow.” Take home what’s on your plate or ask if you can pack leftovers. Or just ask Aunt Agnes for her killer pumpkin pie recipe so you can make it if the mood strikes. 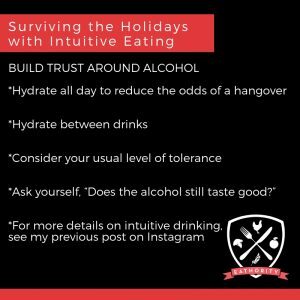 Because alcohol can interrupt signals that your body relays to you about eating, drinking intuitively allows you to stay attuned to your needs and build trust around alcohol. Going into a dinner well hydrated can really soften the blow of a hangover. This advice is for people looking to avoid the dreaded hangover. If you’ve made the decision to get tipsy and deal with the hangover potential, ignore this bullet point! How many drinks can you usually have without feeling hungover or dragging the next day? Aim to keep your intake within your tolerated range. Fullness isn’t really a factor in alcohol, so satisfaction is the guiding principle here. If alcohol starts to lose its flavor, consider slowing down or stopping. For more information on how to enjoy alcohol and drink with attunement, access my article on intuitive drinking here. Unless someone is cooking up a low FODMAP feast, it’s likely that party foods will bring on some of your symptoms. Try your best not to overeat (this can be a trigger! ), and if symptoms occur, some clients have told me IBgard may help alleviate some of the discomfort. 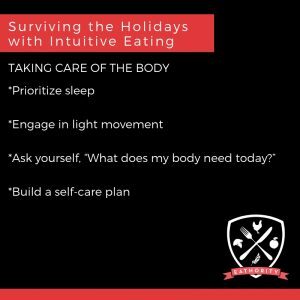 There you have the complete guide to surviving the holidays with intuitive eating. I’ve included some pinnable images below for you to screenshot or save. And feel free to comment below on any holiday survival tips you have!